It’s about a woman named Sherry. 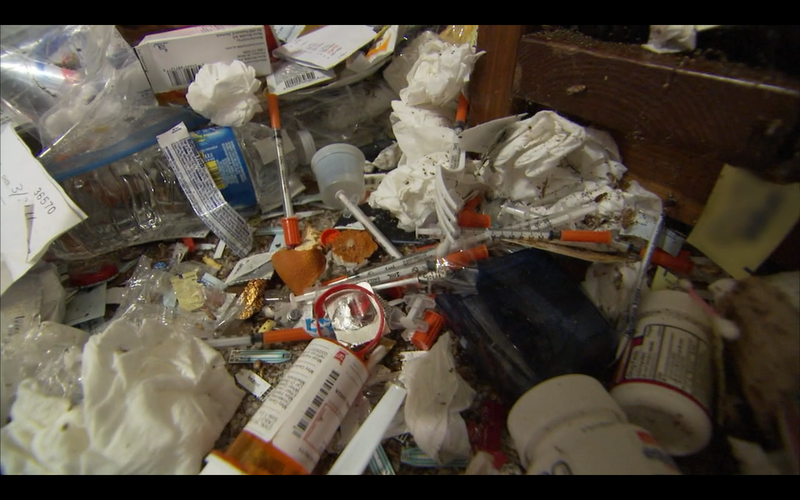 She lives in her hoarder-home with her daughter Ally and her son David. She collects disability for 13 illness including fibromyalgia and diabetes. Her husband, Mark, left the home because of the hoarding. 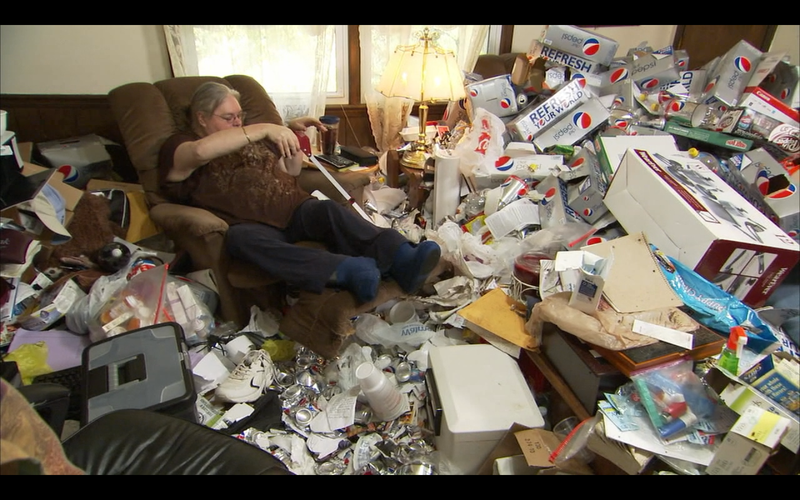 He says that his wife had always been a hoarder, that “she hates to get rid of anything, even trash.” Interview quotes like this as well as the backstory and narration seem to be setting you up for a typical episode of Hoarding, complete with traumatic backstory of how the family moved into the home to take care of Sherry’s mother, who shortly after died, at which point the hoarding became more extreme. However, despite the seemingly familiar setup, despite the quotes from her husband which depict her as a typical hoarder, you immediately know something is different from the footage alone. 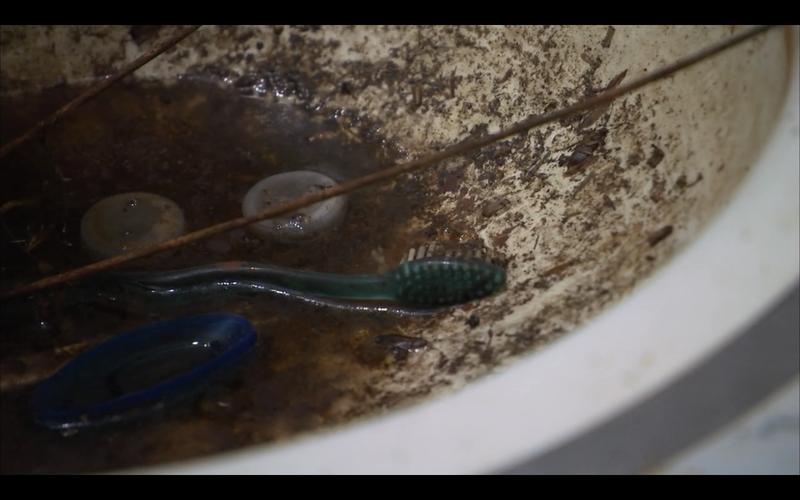 Most of the episodes on these shows, while there may be trash, or there may be pests, generally the hoarder has a compulsion to collect, and it’s usually stuff the hoarder at least *perceives* as valuable. Instead, you get the impression that Sherry is simply someone who has given up entirely on life. You see the most deplorable conditions and filth imaginable. In every frame of the video there are hundreds of cockroaches skittering. There are black widow spiders in the kitchen. Sherry is a diabetic who leaves piles of her needles laying around the house we see her teenaged daughter ambling through barefoot. 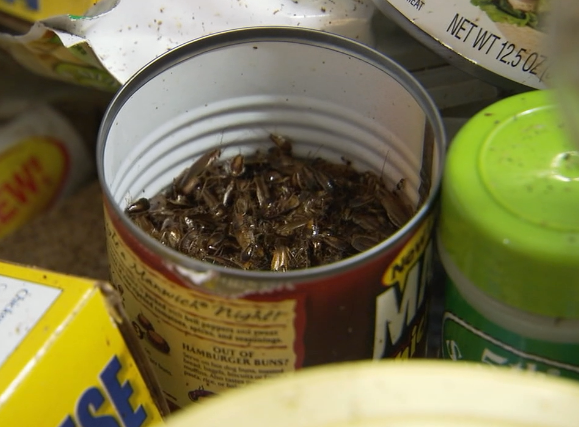 We see a coffee can filled with cockroaches. You see the most vile bathrooms imaginable, complete with festering sinks and filled to the ceiling with discarded maxi-pads. We see what must be a typical day in the life of these individuals. The daughter Ally wakes her mother up in the morning. She fetches her mother’s booties so she can shuffle safely through the refuse to get to her chair in the living room. She sits down and grabs a nearby 2-liter of Diet Pepsi off the floor and starts drinking it while her daughter is in the roach-infested kitchen making her mother’s breakfast. You get the impression that Sherry sits in that chair for the full day before going back to bed and doing it all over again. 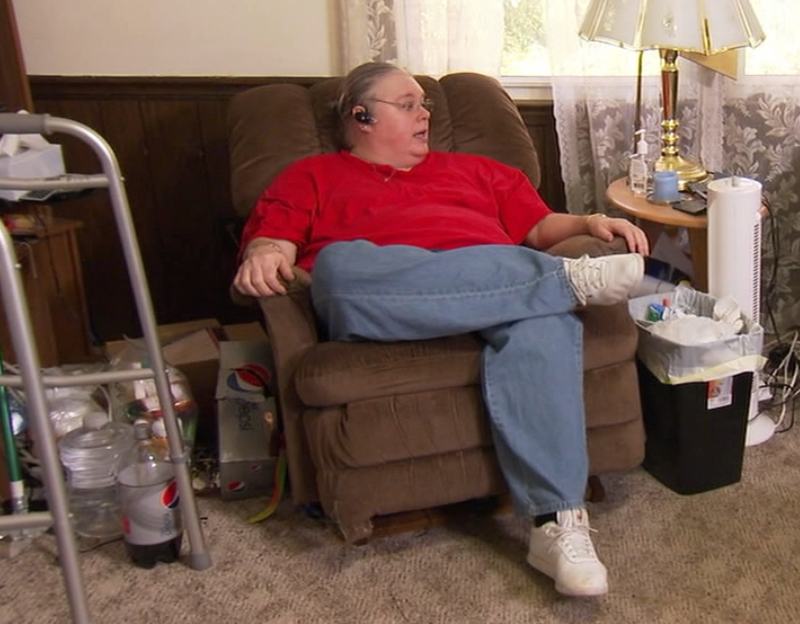 In fact, most of the early part of the episode is the entire family saying that Sherry uses her health as an excuse, and pleading with her to just get out of her chair. The exterminators come in and are rendered almost speechless, and leave in disgust. The cleanup crew comes in but the conditions are so vile they need to bring in the HAZMAT team. You wonder, why no one does anything about the situation this entire time. The father says that Sherry has full custody, and won’t let the children stay with their father because it would reduce her benefits. Obviously we don’t know what the real story is but it seems that either the father didn’t fight to get his kids out of hell, or our legal system is literally broken. You wonder why the psychologist doesn’t immediately make a call to get the kids out of the home. You wonder why no one does anything, everyone just goes along with the show, even when it’s clear that Sherry is an unfit mother whether the home is clean or not. You wonder why, even if Sherry is physically and mentally ill, that she doesn’t seem able to admit or care that the situation is unlivable or want better for her kids. You wonder how the kids are able to just pretend that this is normal. When confronted during the cleanup about the fact that there are black widow spiders in the kitchen, her answer is “Ok. So?” Then she shuffles off to sit in her van, upset that she’s being implied to be a bad mother, then later goes to lay down in bed and tells the cleanup crew to just shovel the garbage around her. In this episode, there is no turning point, no acceptance of responsibility, not even so much as a break from Sherry’s emotional flatline save a few tears over the psychologist “attacking” her. There is no hope for the future, except that Sherry’s children bear her dead weight to make sure that things don’t get this bad again. At the end they have a forced family reunion where they celebrate how much things have improved, even though nothing has changed and you can see a new pile of diet soda next to Sherry’s recliner, in the exact same spot, in frame. The editors of the show are trying to fit the “plot” that all of these shows have onto this case, but because nothing positive came out of the experience, save maybe the children’s ability to cope with these abusive circumstances with grace and a positive attitude, it doesn’t work and you are left feeling sick inside. You get angry at the fact that circumstances of birth and evolved sense of familial loyalty allows people to accept such conditions. When you watch these type of shows, you might feel humor or horror at how ridiculous some of the homes are. You might feel pity and sympathy for the families and for the hoarder themselves. You might feel impressed or happy at the resolution to change, and the turnaround at the end. You might feel nothing because it’s trash TV and you don’t really care anyway. Not here. Instead you just leave feeling disgusted. This entry was posted in hoarding, media, shows, television and tagged hoarding, media, netflix, shows, television. Bookmark the permalink. One small video on that device gives me chills: Carl Sagan’s “Small Blue Dot.” Carl’s video reminds us that we live in a closed system on this small planet. Step away from your computer. Go outside. Talk with someone face to face. This hoarder needs to get some air. I’m going now. The mother is bad enough but to me the father is even worse. He doesn’t have some ailment whether real, imagined, or just completely made- up to blame for his complete inability to be a father. When things got rough he ran out the front door but left both his children behind. And even with a camera in his face showing his inability to be a father he still doesn’t rescue his children from this garbage heap. And apparently it was more important for the show to film the episode then it was to rescue these children. If they were not being filmed the first thing the psychologist would’ve done was to phone CPS. But even she left them to stew and it. Everyone failed those children. Mother, father, family and friends, school, psychologist and TLC. What a disgusting human being. Why weren’t her kids with her husband, or with CPS….